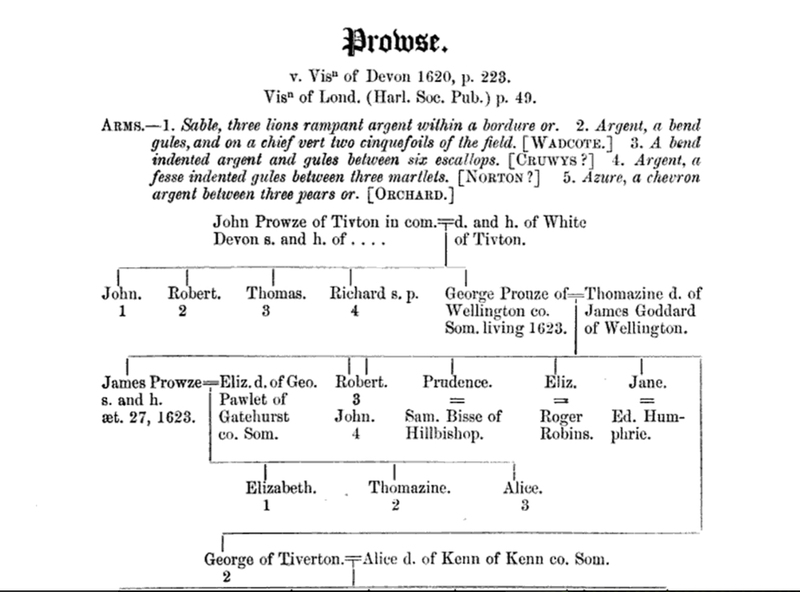 George PROUSE (PROWSE) (1608 – 1684) was Alex’s 10th Great Grandfather, one of 2,048 in this generation of the Shaw line. 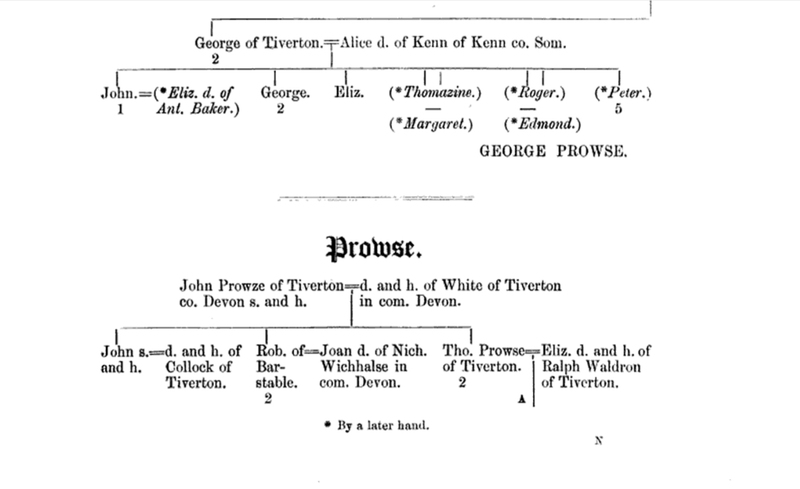 George Prowse was born after 1608 in Tiverton, Devonshire, England. His parents were George PROUSE and Thomazine GODDARD. George Prowse arrived in Jamestown on the ship Diana in about 1619. He married Alice KENN date and location unknown. George died afer 25 Sep 1684 in Kingston, Somerset, England. Alice Kenn was born about 1612 in Hutton, Somersetshire, England. Her parents were Edmund KENN and Margaret STRODE. Alice died after 1642 in Somersetshire, England. 2 Oct 1665 in Salisbury, Essex, Mass. 2 Sep 1706 in Amesbury, Essex, Mass. George Prowse arrived in Jamestown on the ship Diana in about 1619. He may be the same George Prowse who married Alice Kenn/Kean. An Alice Kean was living at the same time in Jamestown. While there are records to indicate that the Alice Kean in Jamestown is the same person as the Alice Kenn who married George Prowse, we don’t have documentation about their marrage. He may have been the same George Prowse, living on Hogg Island in 1623. The LDS records indicate that all of George and Alice Kenn Prowse’s children were born in England. Whether this is true or not I don’t know. All I know is what the LDS records indicate. If they are true, then George and Alice must have returned to England to raise their family. Son George, must have then come to the colonies in the early 1650s to be in St. Mary’s County and the above mentioned Will. There are other possibilities to explain the births in England andProwses in Maryland. 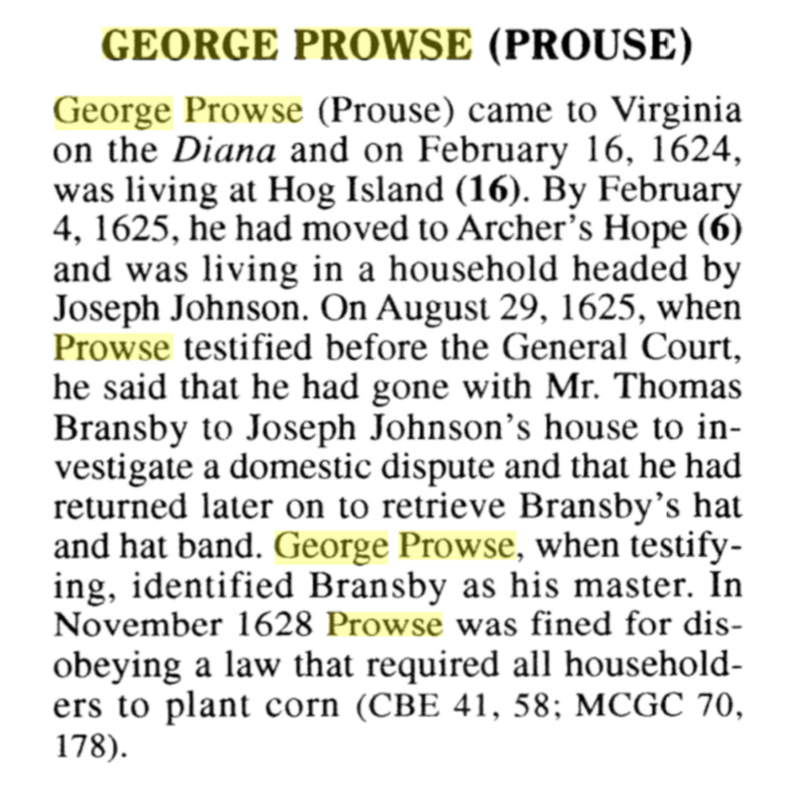 George Prowse/Prouse may be the George Prowse who was in St. Mary’s County, Maryland in the 1654 Will of Edward Cotten in which he receive a calf. In 1666 George Prowse was on a jury of inquest in a murder investigation when a bound servant was struck and killed by the person he was bound to. George may have been the originator of the Maryland Prouse family. He and Mary had four children according to his Will. They were George, Elizabeth, Mary, and Phillip. Cotten, Edward, Newtowne, St. Mary’s Co 8th Apr., 1663 22nd Apr., 1663. To Mr. Mr. Starkey., Ignatius Warren, eld. son of John Warren, George Prouse, James Grinaway, Thomas Matthews, Jr., Darby Flanagan and John Wheatley’s eld. dau., personalty; also personalty to establish a school at Newtone at discrection of exs. To Barnaby Jackson, personalty provisionally. To John Warren, 450 Am of land at Newtone. Exs Thomas Matthews, Ralph Crouch. Test: John Pile, Walter Pakes. I George Prouse doe here bequeath my Soule to Almighty God. And my boddy to be decently buried. Here now in perfect & Sound memory I doe order & give unto my Eldest Sone George Prouse 2 two thousand pounds of tobacco for Learning and to my youngest Sone Phillip 2 two more for Learning & two thousand for the girls that is one thousand pounds of Tobacco apiece towards learning, & I here make my wife whole Executor to see this ordered for the Chilldrens good to sell some of ye land for the Tobacco toward the Chilldrens learning & this is my last Will & Testament. 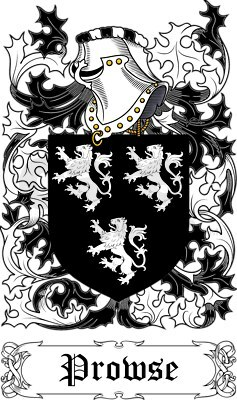 This entry was posted in 12th Generation, Immigrant, Immigrant - England, Immigrant Coat of Arms, Line - Shaw. Bookmark the permalink. McCartney writes (p436) that Alice Kean (Keen, Keene) was a servant on February 16, 1624, in the Jamestown home of John Hall and his wife. Alice joined the household of James Johnson I, who also lived on Jamestown Island. McCartney proffers that Alice may have been a relation to Lt. Richard Kean who died during the March 22, 1622, Indian attack on Martin’s Hundred. It is a reasonable conclusion that George Prowse and Alice Kean met circa 1625 in the James Johnson household. Additionally: A George Prowse and an Alice Kean are listed on the Feb 16 1623 inventory of survivors following the 1622 Jamestown massacre. George Prowse was at the Plantation near “James Cittie” and Alice Kean was “In James’ Island”.